To replace TCM, refer to TM-142, "Description". 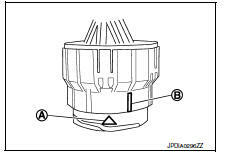 To replace transaxle assembly, refer to TM-144, "Description". 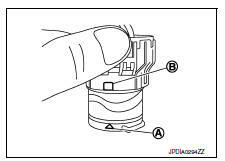 To remove/install or replace G sensor, refer to TM-147, "Description". 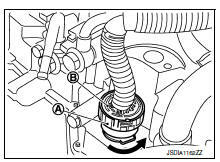 Turn ignition switch OFF and disconnect the battery cable from the negative terminal before connecting or disconnecting the CVT assembly harness connector. Because battery voltage is applied to TCM even if ignition switch is turned OFF. When connecting or disconnecting pin connectors into or from TCM, do not damage pin terminals (bend or break). Perform TCM input/output signal inspection and check whether TCM functions normally or not before replacing TCM. Refer to TM-114, "Reference Value". Perform вЂњDTC (Diagnostic Trouble Code) CONFIRMATION PROCEDUREвЂќ. If the repair is completed DTC should not be displayed in the вЂњDTC CONFIRMATION PROCEDUREвЂќ. Always use the specified brand of CVT fluid. Refer to MA-11, "Fluids and Lubricants". Use lint-free paper not cloth rags during work. Dispose of the waste oil using the methods prescribed by law, ordinance, etc. after replacing the CVT fluid. The ECM has an on board diagnostic system. 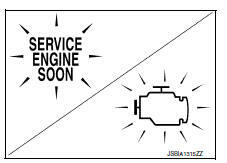 It will light up the malfunction indicator lamp (MIL) to warn the driver of a malfunction causing emission deterioration. Be sure to turn the ignition switch OFF and disconnect the battery cable from the negative terminal before any repair or inspection work. The open/short circuit of related switches, sensors, solenoid valves, etc. will cause the MIL to light up. Be sure to route and secure the harnesses properly after work. Interference of the harness with a bracket, etc. may cause the MIL to light up due to a short circuit. Be sure to connect rubber tubes properly after work. A misconnected or disconnected rubber tube may cause the MIL to light up due to a malfunction of the EGR system or fuel injection system, etc. 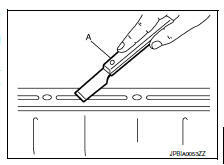 Be sure to erase the unnecessary malfunction information (repairs completed) from the TCM and ECM before returning the vehicle to the customer. Rotate bayonet ring (A) counterclockwise. 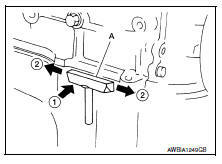 Pull out CVT unit harness connector (B) upward and remove it. Align marking (A) on CVT unit harness connector terminal with marking (B) on bayonet ring. Insert CVT unit harness connector. 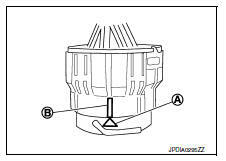 Rotate bayonet ring clockwise until marking (A) on CVT unit harness connector terminal body is aligned with the slit (B) on bayonet ring as shown in the figure (correctly fitting condition). Securely align marking (A) on CVT unit harness connector terminal body with bayonet ring slit (B). Then, be careful not to make a half fit condition as shown in the figure. Never mistake the slit of bayonet ring for other dent portion. Always use the specified brand of CVT fluid.